Paul Pogba has scored 11 goals this season! As the English Premier League season enters its final few months, there are bound to be many kinds of analysis of the entirety of the season. While the title race is expected to be fought until the very last day, there are many midfielders who have displayed their true talent and potential this time around. Surprisingly, most of the midfielders from this list are not amongst the top six teams and that just further highlights how the other fourteen teams are trying their best to rope in or develop players with better talent and varied skill-sets. This is naturally enabling them to compete better and break it into the top eight spots somehow. Without further ado, let us have a look at the five most impressive central midfielders from the Premier League this season. 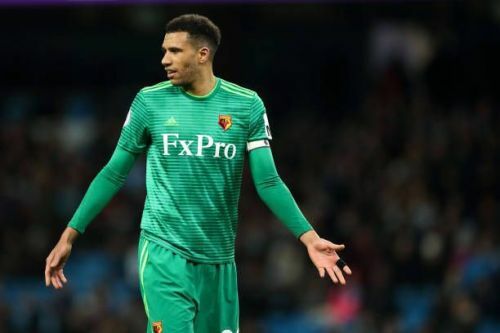 Etienne Capoue has been a constant presence in Watford’s midfield this season, acting as a shield and breaking down opposition’s attacks through immense tenacity. He generally undertakes the role deeper into the midfield and uses his game-reading awareness to intercept passes regularly. The French international has registered 2.9 interceptions per match in the Premier League this season, along with having tackled 2.7 times on an average too. He is a gritty midfielder who is strong aerially and uses it to the team’s benefit while defending set-pieces too. Capoue’s overall playing style might not stand out amongst the rest but he is probably the fulcrum around which the team functions cordially. His tireless defensive approach means that the other players have the freedom to move around and play higher up on the pitch. While Capoue stands out in these attributes, he could surely work better to contribute on the other side of the pitch too. So far this season he has scored once and assisted thrice, whilst having delivering only 0.3 key passes on an average. However, for his consistently impressive performances for Watford, Capoue fittingly deserves a place in this list.